It seems only fitting that a city at the heart of the Industrial Revolution should also be the birthplace of heavy metal music. A city built on a legacy of metalworking in noisy factories filled with grinding, thumping machinery provided a perfect template for a new type of raucous rock. And it all began with an industrial accident in one of the city’s factories. In 1965, Tony Iommi was a guitar-loving teenager who played in a band called the Rockin’ Chevrolets and worked in a sheet metal factory. When the band were offered work in Germany, he decided to leave the factory. But on that last day of work, he had an accident with one of the machines and lost the tips of his right-hand middle and ring fingers. At just 17, he thought his musical dreams were all over. But then he heard the music of jazz guitarist Django Reinhardt, who also lost two fingers in an accident. Iommi put lighter strings on the guitar, tuned his guitar down for easier fretting and relied on power chords with their relatively simple fingerwork. It would later prove crucial for the birth of Black Sabbath and the genre as a whole. Having mastered the guitar again, it didn’t take Iommi long to get back into the local music scene. Tony ended up alongside drummer Bill Ward in a group called The Rest, then another called Mythology. Mythology split up around the same time as a band called Rare Breed. Iommi and Butler joined forces with two former members of Rare Breed - singer John ‘Ozzy’ Osbourne and guitarist Terry ‘Geezer’ Butler - and a new band was set up, eventually calling itself Earth. Iommi left to join Jethro Tull but it didn’t work out and he rejoined Earth only a month later. With confusion arising over another band called Earth, a new moniker was needed and Butler noticed a cinema across the road from the rehearsal rooms was showing the horror film Black Sabbath, starring Boris Karloff. Thus, heavy metal band Black Sabbath was born in August 1969. Butler had detuned his bass guitar to match the adjustments Iommi made to cope with the loss of his fingertips and one of the signature sounds of heavy metal was created. But Birmingham hasn’t always shouted loudly about its musical pedigree, first celebrating it in 2011 with a summer of events and exhibitions called Home of Metal. During the festival, heavy metal music blasted through Birmingham Museum’s normally quiet galleries and the links with local industry were confirmed. Not just metalworking, but the local tanneries that helped create the leather-and-studs look of metal bands and their fans. And that rock legacy is much more than Black Sabbath. Judas Priest, Napalm Death and Godflesh were formed in Birmingham, and Led Zeppelin’s Robert Plant was born in West Bromwich. Diamond Head come from nearby Stourbridge and Bev Bevan, a member of Birmingham bands The Move and ELO, was born in Sparkhill, Birmingham, and went on to become the tour drummer for Black Sabbath. Glenn Hughes - who has worked with Deep Purple, Black Sabbath and Black Country Communion - is from Cannock. Black Country Communion’s drummer Jason Bonham is from Dudley; he’s the son of Led Zeppelin drummer John Bonham, who was born in Redditch. Jethro Tull’s Dave Pegg is from Birmingham, while Wolfsbane were formed in Tamworth with lead singer Blaze Bayley, who is from Birmingham and went on to Iron Maiden before going solo. Glam rock favourites Slade attracted a heavy metal following with the harder sounds of 1980 hit We’ll Bring The House Down and their 1981 album Till Deaf Do Us Part and its single Lock Up Your Daughters. The band were founded in Wolverhampton, where drummer Don Powell and bass guitarist Jim Lea were born. Lead vocalist Noddy Holder was born and raised in Walsall and guitarist Dave Hill had moved to Wolverhampton as a child. Outside the heavy metal genre but still within the wider world of rock, The Moody Blues were formed in Erdington, Birmingham, and Fleetwood Mac’s Christine McVie grew up in the city’s Bearwood area, during the years her father Cyril P.A. Perfect was a concert violinist and music lecturer at the city’s St Peter’s College of Education. ELO also originated in Birmingham. Jeff Lynne was born in Shard End and lived in Walsh Hall at Meriden before selling the mansion to UB40’s Robin Campbell in 1995. Fellow ELO band member Roy Wood was born in the Kitts Green area of the city and was also involved with The Move and glam rockers Wizzard. 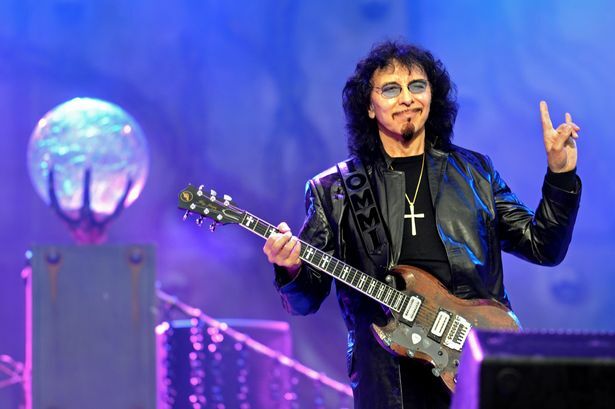 Iommi, who has often had to explain to Americans that he is from Birmingham in England, not Birmingham in Alabama, has always hoped the city does finally get the recognition it deserves for its huge contribution to the genre.